Materials combining the hardness and strength of diamond with the higher thermal stability of cubic boron nitride (cBN) have broad potential value in science and engineering. Reacting nanodiamond with cBN at high pressures and high temperatures provides a pathway to such materials. CDAC partner Steve Jacobsen (Northwestern), along with his Research Associate Xiaobing Liu, and scientists from the University of Chicago, Rice University, the University of Bayreuth, and Jilin University, report the fabrication of C2-BN nanocomposite (2:1 ratio of diamond to cBN), measuring up to 10 mm in its longest dimension. The nanocomposite consists of randomly-oriented diamond and cBN domains of 50-250 nm, stitched by sp3 hybridized C-B and C-N bonds. The B-C-N solid solution within the sutures leads to bulk p-type semiconductivity with an activation energy of 6.2 meV. This new study, published in (italic) Scientific Reports, shows that dislocations near the sutures accommodate the lattice mismatch between diamond and cBN. Nanotwinning within both diamond and cBN domains further contributes to a bulk hardness ~50% higher than sintered cBN. 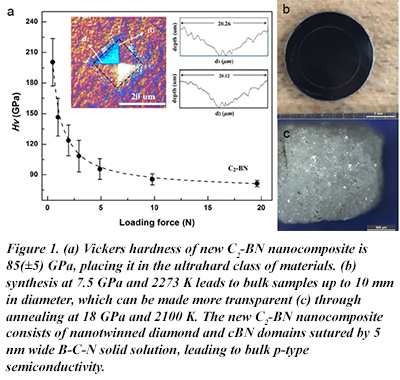 The C2-BN nanocomposite is stable in air up to 1183 K and becomes transparent when re-annealed at higher pressures and temperatures (18 GPa and 2100 K) [X. Liu et al., Sci. Reports 6, 30518 (2016)].